More and more in recent years, people have been plagued by the problem of counterfeit tickets. These are usually concert tickets, but sports tickets and even theatre tickets have been subject to fraud, too. Of course, this creates problems for those who've paid for the tickets, only to discover they're fakes, but also to venues, faced with irate customers, and also for legitimate ticket brokers who make their living selling tickets for sold out events at a premium or obtaining cheap tickets for events. The fake tickets, for events where demand for seats is high, are usually sold online. It could be through a website set up by the scammers or through online auctions. They're usually offering concert tickets for big tours which might otherwise be sold out, sports tickets for cup finals or important playoff events, or theatre tickets for in-demand West End productions. After paying for the tickets, whether directly or by winning the auctions, there are two possibilities. The tickets might not arrive, and the buyer will be continually fobbed off with excuses until the scammer simply disappears, or, more commonly, the tickets will be received and it will only be when the buyer presents them at the venue that he discovers they're fakes. Either way, there's little chance of the purchaser getting back the money paid for tickets, which can easily amount to hundreds of pounds. It's important to distinguish between scammers and legitimate ticket brokers. 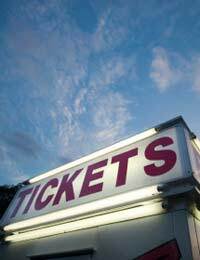 They, too, offer tickets for events that might be sold through normal channels, and often mark up their prices for profit, but many also tend to offer cheap tickets. They work by buying blocks of tickets for events and re-sell them. Scammers pose as ticket brokers, and it can be difficult to tell the difference sometimes, especially as most of them work online. There's no single way to distinguish between the real and the fake when it comes to ticket sales, at least in online sales. When it comes to in-person sales, which can happen outside the venue, you need to inspect the ticket and compare it to a real one before you make a purchase. With online auctions, check the seller's feedback and what else he or she has for sale. If a number of tickets for the same event are being offered and it's an individual selling, not a business, it's probably fake. With websites it can be a lot more difficult, but make sure the business has a phone number and street address listed on the site, as all proper businesses will (even try calling the number as an added precaution). Big concert tickets, sports tickets and theatre tickets do sell out quickly, so an attempt to buy tickets through the usual channels can end in frustration for many people, and they don't want to disappoint spouses or children. That's understandable, but you need to exercise extreme care when buying tickets from anyone except proven legitimate outlets and brokers. It's in your own interests when buying tickets, especially sold out events, and most particularly if buying online, to establish the bona fides of the seller before parting with your money. You might pay more, but using a legitimate ticket broker will at least guarantee you a real ticket.